Think twice about using the #MLKday hashtag to promote your brand – remember last year? The day this blog post was published, January 15, 2015, would have been Martin Luther King Jr.’s 86th birthday. Each year, Americans observe a national holiday on the third Monday of January to recognize Dr. King and the American Civil Rights Movement. Marketers, PR folks, and advertisers are always looking for ways to get their message in front of as many eyeballs as possible. Often, this means trying to piggyback on an existing major event, celebration, or holiday. A great example of this was Oreo’s famous “You can still dunk in the dark” tweet sent during the power outage at Super Bowl 47. It was clever, timely, and a bit funny as it made light of an awkward situation. The Super Bowl blackout had nothing to do with cookies, but after this tweet, it did. MarCom professionals can run into challenges when they apply this strategy to events with a very serious nature: Remembrance Day (Common Wealth Nations), Veterans Day (US), Martin Luther King Jr. Day, etc. Brands run the risk of looking too opportunistic as they try to cash in on the importance and sacrifice of others. Last January, several public figures and brands made questionable (to put it nicely) social media posts trying to cash-in on the popularity of the #MLKday hashtag used to recognize Dr. Martin Luther King Jr. Day. Reviewing a few of these missteps from last year has led me to three key thoughts on the subject. 1. Book a party bus for MLK Day? 2. 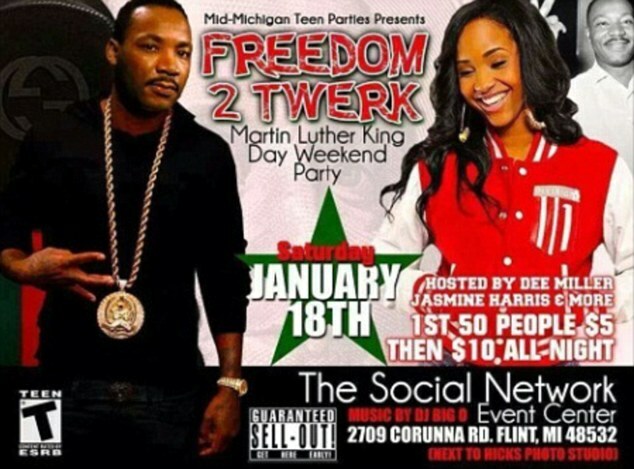 The infamous “Freedom to Twerk” event that was planned for the good folks in Flint, Michigan drew attention to itself after the promoters Photoshopped Dr. King’s head onto a body of a Man wearing a gold watch, chain, and medallion while making what appears to be a “west side” hand gesture. After this poster gained notoriety, the party was eventually cancelled. Several people weighed in on the issue, including MLK’s daughter, Dr. Bernice King, who was appalled by the poster. 3. Sarah Palin’s tasteless political grandstanding starts with quoting Dr. King’s “I have a dream” speech, and concludes with her telling President Obama “no more playing the race card.” Yikes. Humour is tough. Attempts at humour during otherwise serious situations may be interpreted as your brand’s attempt to make fun of, or devalue the purpose of, the event. 1. This misguided tweet from Nyquil reads like a joke that didn’t quite hit the mark. Today is the day for dreaming. Happy MLK Day. 2 & 3. Two other notable attempts at humour came from the Chive, and a pornographic website. In both instances they used humour in a way that some would consider distasteful, but considering that the source of these jokes were the Chive and a pornographic website, they pretty much lived up to expectations. Instead of posting these attempts at humour on davidhallsocialmedia.com, I’ll let you google those two tweets yourself. This is obvious self-promotion. It looks insensitive, self-interested, and opportunistic. If you are going to run an MLK Day promotion, make sure it makes sense within the context of the observance. Be aware of the nuanced difference between an event designed to celebrate as opposed to one dedicated to recognize something. What the heck do potato stamps, cereal, apples, diapers, or a day at the salon getting pampered have to do with the civil rights movement? Happy Martin Luther King, Jr. Day. Get a good breakfast so you're fueled to do something meaningful today! This Pampers Facebook promotion is particularly cringe-worthy because (as a current diaper customer) I can tell you that 10 rewards points is what you get for buying about $5 worth of baby bum wipes. They almost couldn’t have offered less. For any organization thinking about joining the #MLKday trending topic this weekend, I encourage you to focus on respect, not referrals; honour, not sales; legacy, not leads; person to person, not business to business; and to make sure your content reflects the nature and tone of the observance. 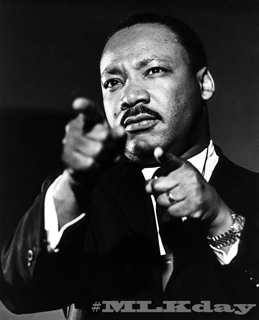 Without question, Dr. King serves as a hero to millions of people around the globe, and is absolutely a hero of mine. Are you a sell out? How about your kid? 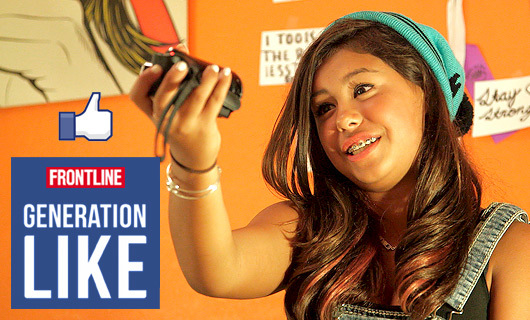 Frontline’s documentary “Generation Like” tells the story of how businesses use social media and big data to sell their wares to members of Generation Z (people born between 1995 and 2010). It urges you to think about this topic from two angles. First, the teens’ perspective. Do they know they are being marketed to, and if so, do they even care? Wrapped in with this is the parental anxiety that exists for those parents who are not up-to-date with social media and digital technology. The second perspective is from the world of business marketing. The film gets into discussions about YouTube fame, collaborations, product integration, and content creation. It asks questions like: how much is a “like” worth? Or a friend? A follower? Or most importantly, the “share”. This documentary primary focuses on the tactics businesses use to “empower” youth to spread marketing messages within their personal social media networks. One teen in this film spends her free time liking and sharing all the Hunger Games content she can possibly find to earn “sparks”. A currency only relevant to Hunger Games movies, that cannot be redeemed for prizes, but it’s used to keep score of who are the world’s biggest Hunger Games fans. Public recognition and a sense of belonging is used as the primary motivator for her behaviour. The film also considers how these teens interact with traditional consumer brands, and if these youths are aware that they are being marketed to. At one point the film’s author asked members of Generation Z what it means to sell out…and none of them could give the traditional Baby Boomer or Generation X version of the term. In fact, they really had no clue what selling out was. One puzzled-looking teen thought that selling out means that there are no tickets left for a concert. Although technically correct, I can assure you that this wasn’t the context in which the term was being used. The film definitely has some cringe-worthy moments. The most notable example I observed was a section near the end of the film when a mother discusses helping her 12 year-old daughter take and post photos to Instagram – her advice “if she (her daughter) wants to get the most likes, I know that all we have to post full body shots” (cringe). I use this documentary as a piece of course content for the Social Media Management courses I teach in the Public Relations (PR) program at Algonquin College. Students have written some fantastic reflection pieces on how this documentary has changed their view of how business and social media interact, and what implications it may have on their personal and professional (PR) lives. You can watch the full doc, and access plenty of bonus content, on the Frontline website… Or use the video above to stream it directly from YouTube (there are more ads in the YouTube version). Definitely a worth the watch. How often do you think about what you are telling the world about yourself when you post an update to your social media profiles? Well, it turns out that you are being studied, whether you know it or not. Earlier this fall, PLOSone published a study that aimed to link the vocabulary netizens use with their age, gender, and select personality traits. The unique twist on this study was the methodology. 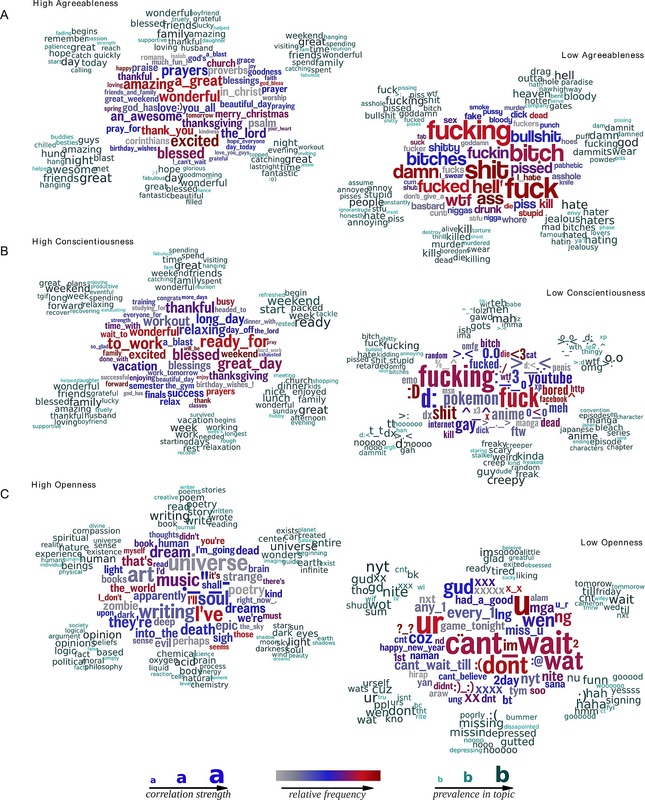 Instead of using known word correlations to base their analysis on, they adopted an open vocabulary approach in an attempt to “find connections that are not captured with traditional closed-vocabulary word-category analyses”. 1. Men are much more likely to use profanity and talk about gaming while women seem to be much more positive and upbeat. 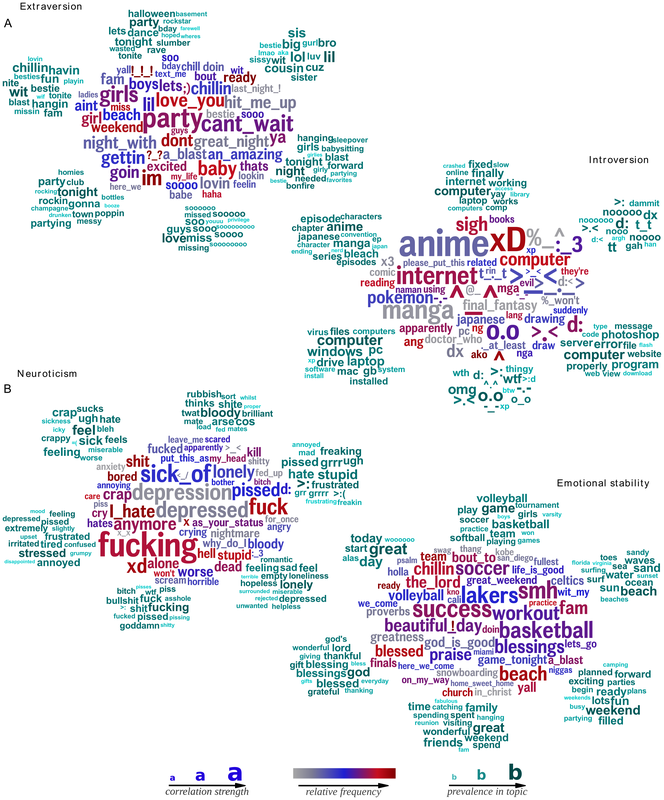 *The size of the word in the word clouds below indicates the strength of the correlation; color indicates relative frequency of usage. Underscores (_) connect words of multi-word phrases. 2. Your age can be determined based on whether you talk about school, work or family. 3. Extroverts like to party, introverts like the internet, neurotics use angry and depressed language, and the emotional stable like….basketball? 4. Finally, the people in your social media networks who’s updates are negative, profanity-filled, and often tiresome, may rank low on the agreeableness, openness, and conscientiousness scale. Beyond simply being “interesting”, these correlations will further help communicators and marketers get their message in front of the right audience – You need to know where your audience “lives” before you can influence them. Be sure to check out the full study “Personality, Gender, and Age in the Language of Social Media: The Open-Vocabulary Approach” for the complete methodology and findings. I write about it all the time – Using social media to provide customer service. I write about the good experiences I’ve had, and I write about the bad ones. It seems like one company always winds up falling short on this task – Rogers Communications. Yes, I know I’m not the only person in Canada who has had a run-in with this telecommunications Goliath, but I’m always optimistic they can turn things around so I keep trying. My latest request for customer service from Rogers was to increase my bandwidth. The entire Twitter interaction with the Rogers CSR I was dealing with, know as “^eb” was great. He answered my questions, looked into issues when I needed more information, offered me a “fair” deal based on how I wanted to increase my service, and was generally pleasant. 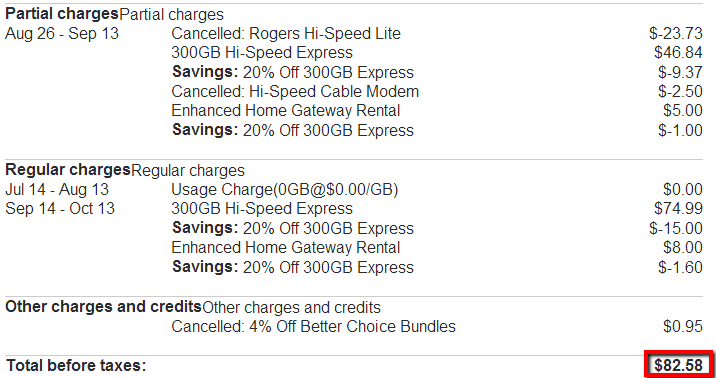 Once we agreed to the new terms of my internet service, I was getting ready to write a glowing davidhallsocialmedia.com blog post about how Rogers had finally improved their online customer service. There was just one more hurdle to clear – making sure what they promised me was actually reflected on my bill. This is where things went sour. I was expecting to see the charges for the new service as promised at a price of $41.60+tx. This was to cover increased upload and download speed, 300GB of bandwidth, and a the cost of a modem rental (tweets below). Instead, I was surprised to see that my bill was almost twice that price at $82.58+tx. I thought “Great! Sounds like a deal. I get increased bandwidth, upload and download speeds, AND a modem rental for $41.60+tx per month. Excellent job Rogers”. So, after discussing the change with my wife over the weekend, I accepted the deal and asked if I could get my new modem that night. At this point, I was happy to fill out the survey with a great review for their customer service, but since I have had issues in the past, I thought it would be prudent to make sure my bill looked OK before I gave them an A+. Even without any of the partial charges, which are only a one-time thing, the price for the new service listed under “Regular charges”) comes out to $66.39+tx NOT the $41.60+tx as promised. That’s an overcharge of almost $25 per month (or about $300 per year). I tweeted Rogers to ask them to remedy the issue. After a few hours of waiting, they said that I was misquoted and it should be $45+tx each month. Fine, but why was I charged $20 more than that on my first bill? According to the a new CSR there was a “system error” which caused the overcharge and I would be credited the difference on my next bill. So it looks like I have to wait another month to see if I actually get the deal I was promised and be able to accurately fill out their customer feedback survey. Lately, I’ve been thinking more and more about the relationship between children, their parents, and the Internet. Most of us would probably agree that parents need to educate their kids about getting the most out of the internet while staying safe. The problem seems to be that, although parents worry about their kids, they are unable, or unwilling, to take the necessary steps to create the next generation of Netizens. The truth of the matter is that the Internet is an 18+ world – always has been. Kids need to be shown early on how to navigate and keep themselves (and others) safe and productive online. 62% of parents don’t think their child can get into that much trouble online. Only 17% believe the online world is as dangerous as the offline world. Only 20% say they know how to find out what their child is doing online. 74% of parents say they don’t have the time or the energy to keep up with everything their child is doing online. 72% of parents say they are overwhelmed by modern technology and just hope for the best. 66% say their child is more tech-savvy than they are, and they’ll never be able to keep up with their child’s online behaviors. Really? The majority of parents don’t think their child can get into that much trouble online? Only 20% say they know how to find out what their child is doing online? 74% of parents say they don’t have the time or the energy to keep up with everything their child is doing online? Come on, get with it parents – invest some time (and potentially money) into internet literacy. If you don’t know where to start, simply Google “How to track kids online activity” and start reading. I’ll bet your kids will be at least this resourceful when they are looking for ways to hide their activity from you. In essence, young people know how to hide their online activity, and most parents are either clueless or unmotivated to do anything about it. The golden nugget in this study, from my perspective, was that the report indicates that nearly half (46%) of these young people said they would actually change their online behaviour if they knew their parents were watching. Below you will find an infographic with similar stats about social media use by children. It also contains plenty of stats covering cyber-bullying, sexting, the amount of time a young person spends online, etc. As you might imagine, I was most intrigued by the “Parental Perceptions” section. For example, 72% of parents worry theirs kids will share inappropriate information with strangers online, but only 33% have helped their children establish privacy settings. It seems as though the actions of parents don’t match their anxieties in this case. For those of us watching social media usage trends, last week was a good week as Nielsen published its annual State of the Media: Social Media Report. This document is a must read. It compares the 2011 and 2012 statistics about how we use our devices and social networks. Some of the findings seemed to be obvious. For example, each year, more people are connecting to the internet, and when they do, they spend more time on it. We already knew that. I’ve written about the continued growth of the “second-screen” before, and the numbers from this report seem to support that trend. Personally, I always watch TV with my laptop or smartphone, and it looks like this behaviour is becoming more common-place. The Nielson report found that 41% of tablet owners and 38% of smartphone owners use their device daily while watching TV, and they are using this internet access to add to their TV watching experience. For example, viewers use their devices to look up product information after they’ve seen an advertisement, search for coupons or deals, look up information related to the program being watched, and (of course) use social media while watching the show. Twitter emerged as the social network of choice when interacting with TV shows – About 1/3 of active Twitter users tweet about the TV show they are watching. Another finding in this report that is close to my heart is that 47% of social media users engage companies to get customer service from brands with which they do business. About 30% of them (including myself) even prefer getting customer care using social media. This drives home the point that as each year passes, it becomes more and more imperative for companies to take a pro-active role in managing their reputation online. Plenty more findings are available in this report, and it’s well worth the read, so be sure to check it out. Special thanks to colleague @DanPihlainen for originally sharing this document.